TwinEye technology offers maximum operational safety for shiny, reflective and even jet black objects. 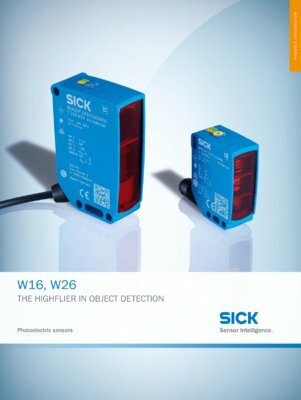 Two receivers in one sensor provide much higher levels of detection reliability. The sensor only changes its output state if both receivers measure the same detection result. In this manner, the W16 and W26 not only reliably detect very shiny and high-contrast objects, but also uneven surfaces. LineSpot technology ensures that perforated, textured, and uneven objects can be reliably detected. The light spot, which has been extended to form a line, allows optical information to be provided about irregularities, such as gaps or rough surfaces. In the case of transparent objects, such as glass bottles or cling film, ClearSens technology guarantees the best perspective. The right detection mode can be set directly on the device according to the object characteristics and attenuation. If the reflector or the front screen of the sensor is contaminated, the photoelectric sensor automatically repositions its switching thresholds thanks to AutoAdapt, thus always providing the highest levels of detection reliability. The new photoelectric sensors have a high ambient light immunity which makes them immune to LEDs or reflections from high-visibility vests. They are also suitable for reliable detection of depolarizing objects such as film-covered containers or parcel tape. The signals received are similar to those from the reflector which explains why switching errors used to occur in common technological designs.